The Cuisinart CGS-W13 is a 13 piece grill tool set that is simple and effective way to equip any griller for the season. 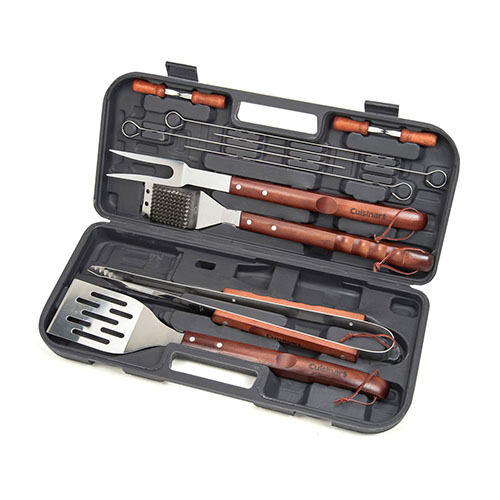 The set consists of 12 individual grill tools inside a recycled plastic case. Each tool is cut from durable stainless steel and set in robust wooden handles emblazoned. The set includes an 18.5" Spatula, 17.5" Cleaning Brush, 18" Tongs, Four 13.5" All Stainless Skewers, and 4 corn cob holders. The tongs, brush and spatula also have convenient leather straps to easily hang them on your grill hooks. 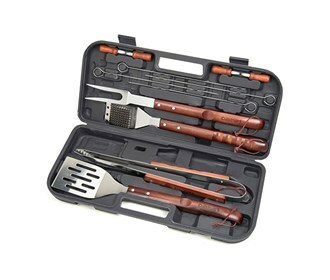 This set can handle anything you throw on your grill and it makes a great gift. The Cuisinart 13-Piece Wooden Handle Grilling Set has many exciting features for users of all types. You can extend the lifetime of your Cuisinart 13-Piece Wooden Handle Grilling Set with the purchase of a FactoryOutletStore Factory Protection Plan. See the Cuisinart 13-Piece Wooden Handle Grilling Set gallery images above for more product views. The Cuisinart 13-Piece Wooden Handle Grilling Set is sold as a Brand New Unopened Item.